A Conservative Councillor on Spelthorne Borough Council and wannabe MP has been convicted on 5 counts of assaulting his ex-girlfriend. 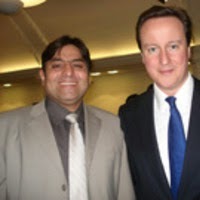 Cllr Asif Ayub claimed that his pint-sized ex-girlfriend was the one abusing him but after hearing evidence to the contrary, including pictures he posted of himself on the Conservative Muslim Forum, the judge found him guilty on all 5 counts. Ayub had already been subject to a non-molestation order taken out by his ex-wife after he assaulted her in 2011.